The romance between Emma Roberts and Garrett Hedlund is heating up! The Unfabulous star was spotted holding hands with her new boyfriend in New York City the newly minted couple following her split with Evan Peters. This is the first time the newly minted couple was photographed together since sources confirmed the relationship between them. As for the outings, the actress, 28, sported a black peacoat, checkered pants and oversized sunglasses. She held a mint green purse in her one hand while with the other hand she held tight to the actor, 34. They pair, who were grinned ear to ear, was looking all smiling and they looked enjoying each other’s company during their outing on Sunday, March 31. As we previously reported, multiple sources confirmed on March 20 that Emma and her now ex-fiancé, Evan Peters had parted ways and that she had already moved on with the Triple Frontier actor. An insider said at the time, "Emma and Evan were heading for a split and now are just friends. Evan has moved out. It wasn’t a bad breakup." Emma and Garrett, who previously was in a relationship with Kirsten Dunst for four years until they broke up in April 2016, were reportedly spotted walking in Silverlake, Los Angeles together at the time. 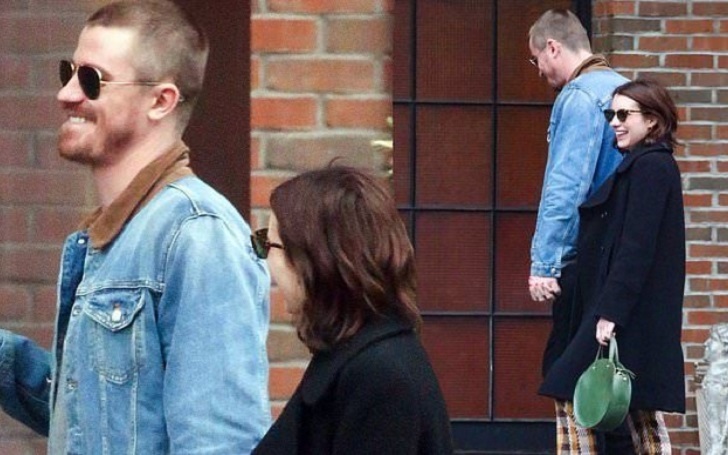 Emma and Evan, 32, who first met while filming Adult World in 2012 and eventually began dating, had become engaged in 2013.